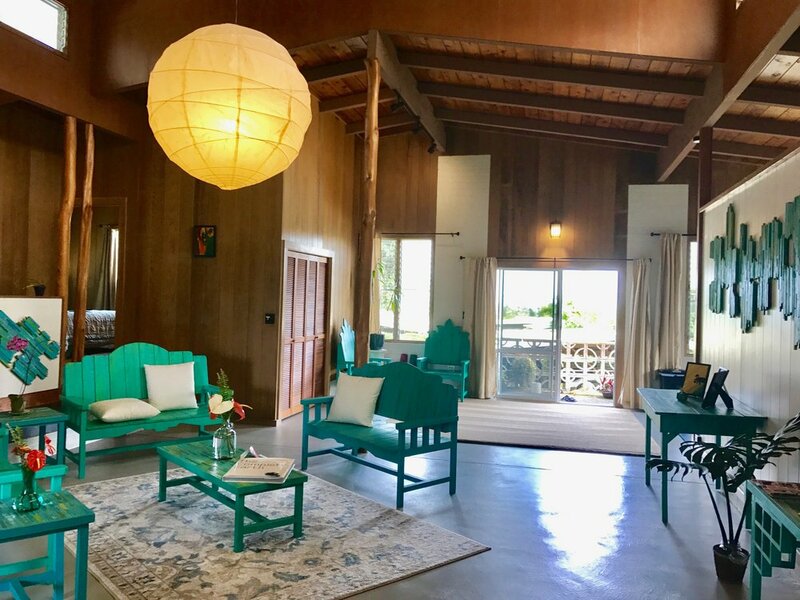 this home offers the peace and serenity of lush, green Hawai'i as well as proximity to downtown dining, shopping, beaches and most importantly, the Volcano! It is the perfect way for travelers to get an authentic Hawai'i experience. With a wide array of natural features, this location offers a look into the island's true beauty. You can explore the famed Kaumana Caves just above or the impressive Rainbow Falls just below. Hawaii's characteristic black sand beaches are a 15 minute drive away. Well suited for nature enthusiasts, you can find avocado, coffee, citrus, mountain apple, lychee, noni, 'ohi'a lehua, orchids, anthuriums, ti and more on the surrounding property. Take the time to celebrate the present moment and connect with yourself and your surroundings. Relax and enjoy the sounds and features of the rainforest in our outdoor jacuzzi or barrel sauna! 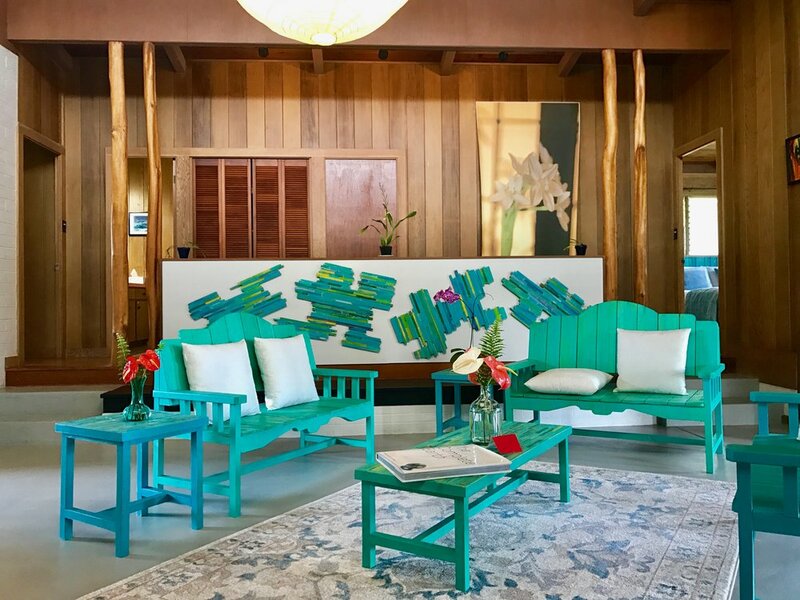 Rooms include queens size beds, dressers, linens, towels, toiletries and information & guides about the island and how to make the most out of your stay on the 'aina. Our property managers can be found on site, eager to meet you and share their knowledge of local attractions and happenings! The house offers access to a kitchen including refrigerator, freezer, cupboards, stove top, oven, sink, utensils, cups, bowls, plates, pots, pans and kitchen appliances such as a coffee machine, electric tea kettle, microwave, and toaster. A washer and dryer are available for use. Furnished living room and dining area. The inn has a spacious common bathroom while the blue room has a private attached half-bathroom, and.the green room has a detached private bathroom with shower located down the hall. Complimentary breakfast is self-served, so you can have it how you like it, when you want it. * bread is baked on premises, in an unlicensed facility. Feel free to use the kitchen at your leisure. Each room has designated fridge and cupboard space, as well as tupperware so you can make and store your food while you travel. We offer a plethora of tableware, utensils, pots and pans for your use as well as appliances such as the stovetop, oven, coffee maker, tea kettle & toaster. Enjoy our zen common areas. The furniture was designed and made by a local artist. 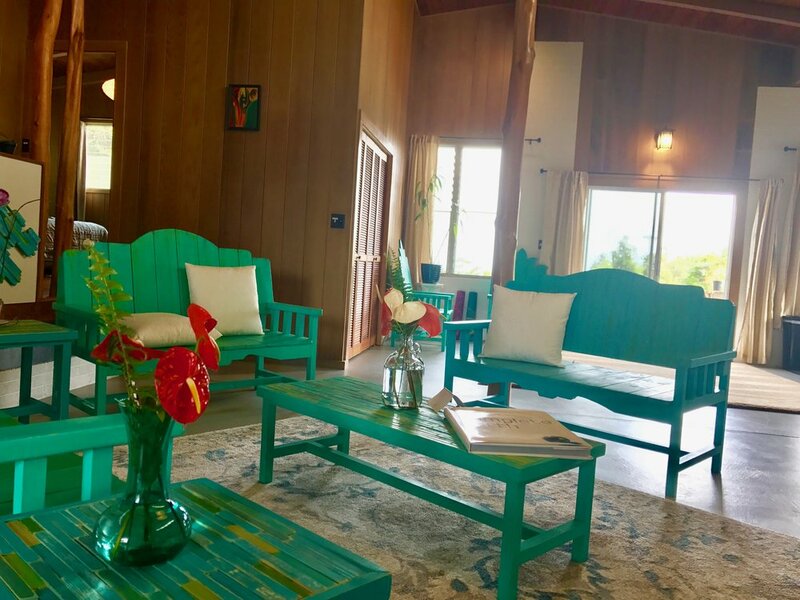 Kaumana Caves Inn is now also offering gear for all your Big Island adventures! 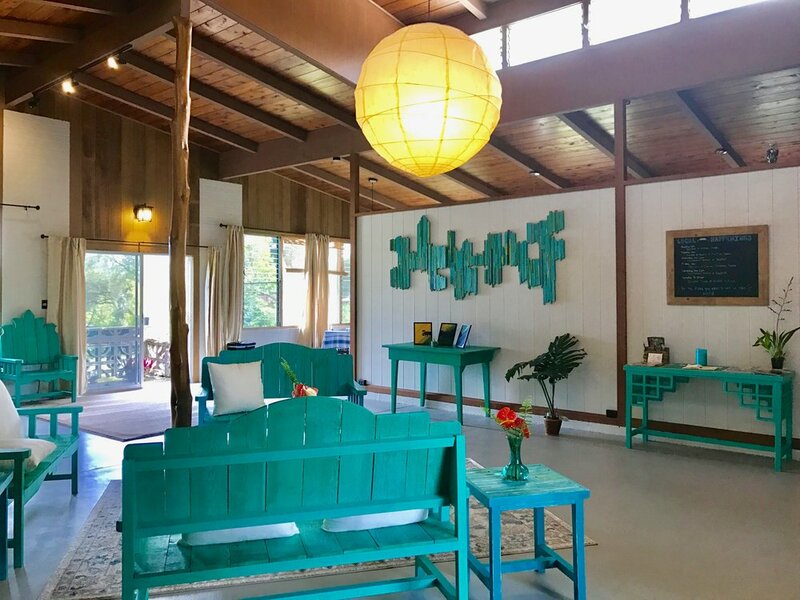 For a flat, refundable rate of $25.00 and a small daily charge, you may rent snorkeling masks, body boards, and bicycles complete with bike locks and helmets for exploring the Big Island! Badminton equipment is also available for onsite games. Inquire with us prior to or during your visit. There is an event board detailing local happenings, so you never miss out on the fun. Feel free to use the free washer and dryer to stay clean on your adventures. Meet Annie, our friendly neighborhood cat. She is very friendly and has a lot to say.